We can make free video & voice call with Line. Call our family and friends as often as we want, for as long as we want. Sometimes, we want to record both sides voice when we take a video or voice call, how might they be implemented? Undoubtedly, Cok Auto Recorder is a good choice for you to do it. 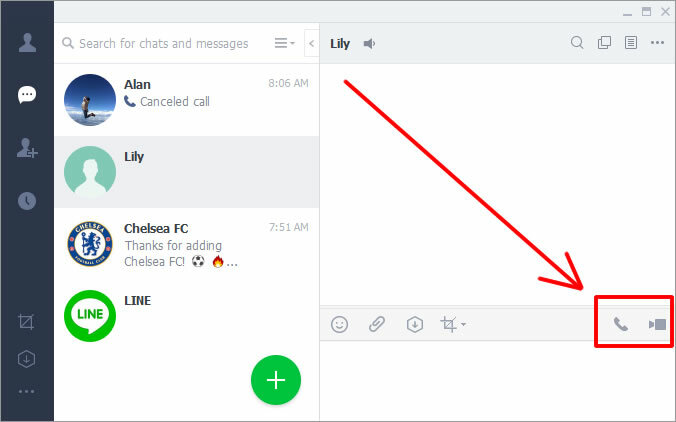 It will record both sides audio automatically when somebody takes a call with Line on PC. It gets audio data from sound card directly, so, even you take earphones, the audio from both sides will be recorded continuously. 1, Download and install Cok Auto Recorder on this website (upper “Free Download” link). After the installation, this recording software will run automatically. Please click “File”, “Settings” menu. 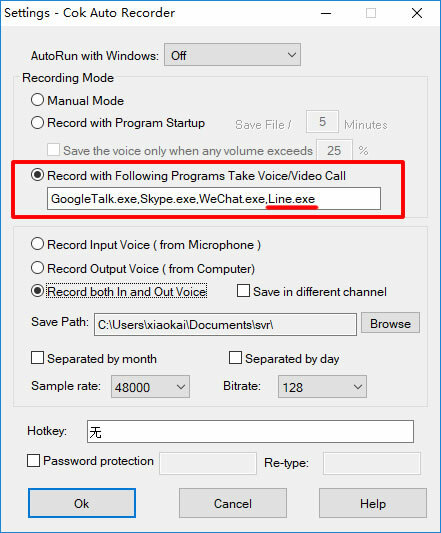 2, Choose “Record with Following Programs Take Voice/Video Call”, and input “,Line.exe” in the end of the textbox. Then please click OK button to close settings window. 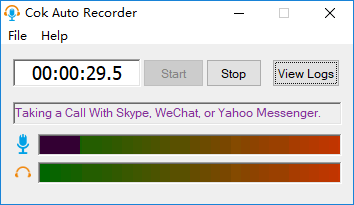 3, Now, an important step need to be done: Close Cok Auto Recorder and run it again to apply the new settings. Please click “File”, “Exit” menu to close this software and double click the program icon on desktop to run it again. 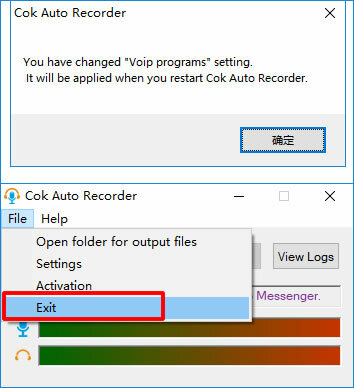 Notice: After you click “X” button on the top, right corner of Cok Auto Recorder, this software will be hidden only (not close). 4, Run Line and take a free call or video call with your friend (or group). 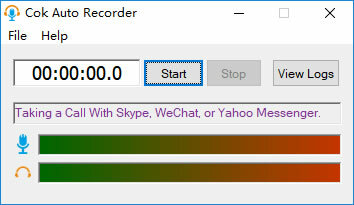 5, Cok Auto Recorder will start recording automatically at the moment when you take or answer a call with Line. And it will stop recording automatically when you or the other side hang up the call. 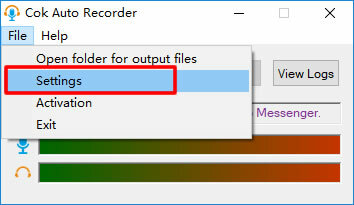 6, You can find the audio file (mp3 format) by clicking “View Logs” button as the following picture. 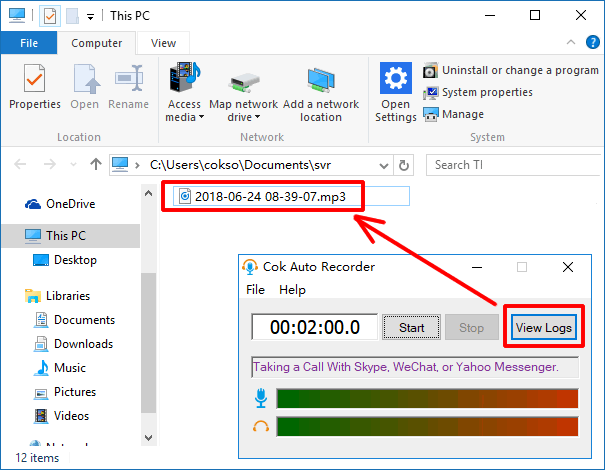 The mp3 file name indicate the time when it starts recording.